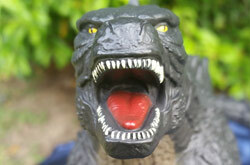 The final Godzilla 2014 figure from Bandai Creations is coming Fall 2015 (the one in this review is a production model) at a whopping 10 inches tall. How is it? Read on! 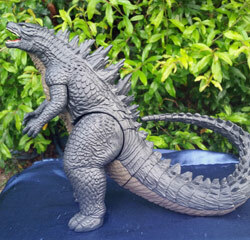 Now this is the second Godzilla 2014 figure from Bandai Creations. The first was the 6.5 inch version of the figure. The second figure in the line based on the 2014 film is quite a bit larger. Although the 10 inch Godzilla 2014 has the same level of detail as the 6.5 inch version, the design is quite different in the pose which is the "victory" pose from not only the film but various posters. The tail is curved upwards which looks cool but also keeps it inside the box. Godzilla comes with no accessories. Godzilla's head can move 360 degrees-something that the 6.5 inch couldn't do- and so can his legs. The tail is divided up into two sections and each section rotates 360 degrees as well. The arms are still in that side to side articulation which I'm not a fan of. You can add more ferocity to the figure (and cooler poses and better playtime if you're the intended audience) if the articulation was up and down. The arms can move 360 degrees but you have to push them past the body for that to happen. Godzilla's got a pretty good paint job going on for the most part. The tongue is a nice deep red and the teeth are a nice white-ish yellow. The paint on the teeth is quickly applied but it's a mass produced figure. The eyes have a nice yellow eyeball with the black pupil looks cool but it's a little lopsided here. Again, it's a mass produced figure so this is pretty common. Finally, the brownish green paint on the chest leading down to the tail looks really nice. There are very few paint blemishes and it was applied very well. The rest of the figure gets its color from the mold which is a really cool mix of blue and green. I quite like it. It's great to see a larger, if different figure of the Godzilla 2014 from the 6.5 inch from last year. I do wish that the head was a little more level and not in the "head to the sky" pose. Don't get me wrong, it's cool to see, it's just that for a toy that's meant for the 4+ crowd to play with, I can see a lot of kids bending the figure forward to compensate for the head looking upward so they can get it so that the head is looking forward and it looks cooler when it's dead on. If you try and pose Godzilla as he is on that back on the box, he'll fall over which is a drag. Overall, it's a great figure for kids and I recommend it for collectors. As a side note, here is a look of the figure in a white, basic prototype box.